Welcome to the 48th edition of the Carnival of Divided Government - The Special Apres - Tax Day Edition. A day of joy and celebration for all patriotic Americans eager to shell over their hard earned cash to our wiser, more enlightened leadership to distribute as they see fit. "What will my money be spent on?" the Dividist wondered as he dropped his return into the mailbox and stumbled into the bar across the street. More wars? Reloading the cruise missile arsenal? More bailouts? More"free money" 0% interest rates for banks? More quantitative easing? More bloated public sector union pensions? More subsidized solar energy fantasies? More entitlements to burden our children and grandchildren for decades to come? The Dividist patriotically hopes that all of his taxes will go to paying for interest on our massive 100% of GDP debt, as there is nothing more patriotic and responsible than helping pay for the decades of incompetence and fiscal irresponsibility of the leaders we elected. It also might keep us from further downgrades by the S&P credit agency. "After receiving more than 40 entries, the Google jury has crowned its $5,000 Grand Prize winner. 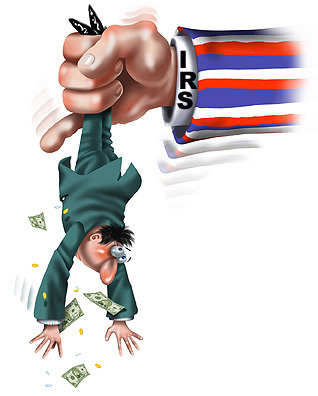 Created by developer Anil Kandangath, "Where Did My Tax Dollars Go?" is "information-rich but elegantly designed," said Google in its blog post. And Kandangath's creation does make it easy for any of us to see how much money goes into each area of the federal budget... The $3,000 runner-up prize went to "Every Day is Tax Day," an online clock that shows you not just how much money you spent in taxes but how many hours and minutes you worked to earn that money. Though they may not take the sting out of paying taxes, these online apps can at least answer some of the questions that befuddle most hard-working taxpayers, especially at this time of year." The Dividist likes the finalist TaxMapper Application, as it permits easy visualization of the federal budget and spending outlays during periods of divided government as well as both Republican and Democratic single party rule since the Reagan administration. The screen shot from the top of the post is from that App. Without further ado, time to check in on our happily divided government and see how it proposes to spend our money in 2011 and beyond. As explained in earlier editions, we have adopted Latin ordinal numeration to impart a patina of gravitas reflecting the historical importance of the series. In this the The Carnival of Divided Government Octô et Quadrâgintâ (XLVIII) - Special Patriotic Tax Day Edition, as in all of the CODGOV editions, we select volunteers and draftees from the blogosphere and main stream media writing on the single topic of government divided between the major parties (leaving it to the reader to sort out volunteers from draftees). Consistent with this topic, the primary criteria for acceptance in the carnival is to explicitly use the words and/or concept of "divided government" in submitted posts. A criteria that, to our endless befuddlement, is ignored by many of the bloggers submitting posts, which sadly results in The Dividist reluctantly ignoring their fine submissions. Among the on-topic posts, essays and articles we choose our top ten favorites for commentary and consideration. We hope you enjoy these selections, and having paid your taxes on time, can enjoy the three-ring circus over how your money will be spent. "Is it perfect? No. I’d be the first one to admit that it’s flawed. Well, welcome to divided government. I can tell you that the negotiations that went on over the last four or five weeks. They weren’t easy, especially when you’ve got another body on the other side of this Capitol that doesn’t want to cut spending, and clearly an administration that doesn’t want to cut spending. But I’ll tell you that this is the best we could get out of divided government." Yes, it is a drop in the bucket, but given that a cut of this scope has never been done before, the Dividist will simply lean back, nod sagely, and with a big self-satisfied grin say "It's a start." Welcome to Divided Government. MR. CARNEY: "I think that the reaction of all of us is that the assessment of the state of the U.S. economy is one we agree with... we believe the process will outperform S&P expectations on the political side of this, which, we obviously have a certain amount of experience here just in these last two-plus years in dealing with Congress, and in the last several months in dealing with a divided Congress and still getting things done. And there is great historical precedence for that to happen. When you can look and hear the competing statements from members of both parties and think there is no way these two sides are going to find common ground and come together -- and yet there is a way because the American people demand it and the American economy demands it." MR. CARNEY: "What we have learned since the midterm elections that delivered the House of Representatives to the Republicans is that despite prognostications to the contrary, we can get big things done. We can get important things done. So this President believes very strongly that, yes, there’s a potential for serious work to be done. It’s not necessarily going to be easy. It’s going to require compromise by both sides. It’s a divided government. But that's how our system works, and he remains confident." Not only does it work, but divided government works very very well. Particularly if you hope to see the federal government exercise some semblance of fiscal responsibility and spending restraint. Welcome to Divided Government. "Here's one of Washington's rich ironies: Many of us may see divided government as a recipe for stalemate, but it's actually wonderful for reducing the deficit. Just look at three of the last four major deficit deals: 1990, 1997 and now this year. They happened when Democrats and Republicans split control of Washington. The exception is the pact Democrats passed in 1993, when they controlled the White House and Congress. Otherwise, deficit breakthroughs have occurred with the kind of partisan tension and high-wire acts we've seen the last few weeks. Given the threat that the inordinately large deficit and debt pose to our economy, maybe we should think of splitting tickets at the polls"
Being a born-again divided government newbie, we can cut Mr. McKenzie some slack. He has yet to learn that voting for divided government is not the same thing as splitting a ticket. It probably has not yet occurred to him that voting for divided government in 2012 will likely mean voting to re-elect Barack Obama. Should be fun to watch the learning curve. 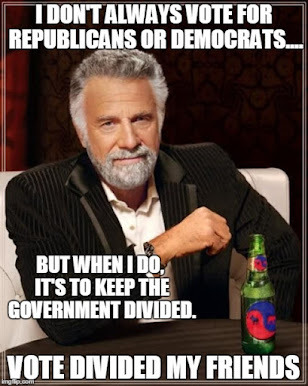 Partisans only think divided government is a good idea when the other party has all the power. 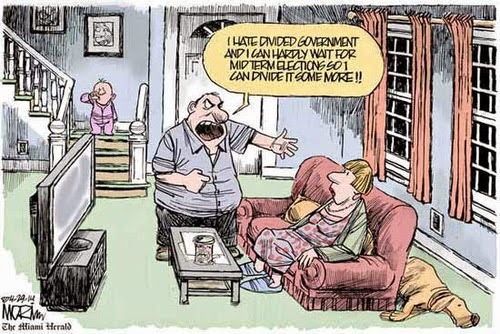 Dividists think divided government is always a good idea. Welcome to Divided Government. "Dividist – great discussion. I have nothing further to add. Keep up the great work and thanks for submitting this for my followers." BoBo does not like this. "Uhhh…nope, not me. I do truly see the benefits of a divided government – and I see where you’re coming from – but – I can’t even fathom another 4 years of Obambi – the most incompetent President in history. I would hope there would be another Democrat contender. Hell, I would vote for Hillary over Obambi at this point. The GOP hasn’t exactly put up any good candidates right now either – of those who have at least expressed some interest in running. 2012 is going to be another bust election – it will undoubtedly come down to a lesser of two evils again – A RINO or A Socialist – neither are good for this country." You win some. You lose some. The Dividist thinks that only 5% of the electorate voting for divided government can keep the 80%+ partisan vote in check. Welcome to Divided Government. "But midterm rebukes don't necessarily portend trouble for presidents in the following election - Presidents Clinton, Reagan and Eisenhower saw their parties face serious electoral defeats two years into their presidencies and went on to victories two years later. Indeed, those midterm elections may even be a boon for Mr. Obama - Americans tend to like divided government, and with the House firmly in GOP hands, they no longer have a unified Democratic Party to vote against." Only 5% .... Welcome to divided government. And our system of constitutionally divided government is undone when one party rule undermines the checks and balances the founder's intended. Barring some serious constitutional tinkering, the best way to keep our government functioning as designed, is to not given either party all the keys. Not now. Not ever. Not even the political party you prefer. Welcome to Divided Government. "Speaker Boehner’s argument is that the short-term resolutions add more opportunities to make cuts, while notable defectors like Mike Pence (R-In.) and Michele Bachmann (R-Minn.) want to make a stand now. The split in Democratic ranks appears to be between those who want to do nothing but cry and those who will go along with some cuts as long as certain sacred programs aren’t touched. 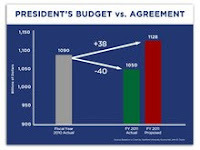 Divided government can be a marginal improvement over the free-spending ways of an unified Congress and executive. Yet this squabbling over crumbs doesn’t mean jack squat if the only thought given entitlement reform is “consideration." Um. A marginal improvement is still an improvement. Particularly when compared to making things an order of magnitude worse, as in the last two years of single party rule. Welcome to Divided Government. "I was talking to political satirist P.J. O'Rourke when he made one of those curious remarks he's known for: "Gridlock's no problem. What really worries me is when there's consensus in Washington." I had to think about that... Looking ahead toward 2012, if party leaders are smart, they will urge Libertarians to immediately throw their support behind Barack Obama, then back every Tea Party candidate for Congress from here to kingdom come. This would ensure that infighting would continue, and as little as possible would be accomplished. On the other hand, if winners knew when to quit, there'd be no such thing as Las Vegas or doubling down. It's more likely the Libertarian Party hasn't noticed they are getting what they wanted, albeit it not the way they planned. Someone ought to tell them." Heh. I cannot help but think that Ms. Costa "discovering" the libertarian affinity for divided government / gridlock is akin to the intellectual chauvinism of Columbus "discovering" America - apparently not noticing the millions of people who already live there. P.J. O'Rourke was not inventing a "curious remark". He was repeating a refrain familiar to most libertarians and/or the libertarian leaning. William Niskanen - former chairman of the Cato Institute - wrote an article entitled "A case for Divided Government" in 2003. In every election since then, articles at Cato, Reason, and other libertarian blogs and outlets have made the case for divided government regardless of whether the Republicans or Democrats were currently in control. I myself have advocated a divided government voting heuristic for the last five years on my blog. Although most people use the terms gridlock and divided government interchangeably (including P.J. and myself), it is not true that one necessarily is the result of the other. The definitive work on this question is Yale Professor David Mayhew's "Divided We Govern". In that work he exhaustively documents that there is no correlation between legislative productivity and periods of divided government or single party rule in the modern era. None. You can have periods of legislative gridlock or profusion in both divided and unified governments. However, for some of us who seek a federal government that is - limited in scope, provides for common defense, protects and respects individual rights, spends and taxes in a fiscally responsible manner, provides effective oversight of all elected and appointed executives and representatives, legislates carefully and slowly, and passes only laws that are tempered in the fire of partisan debate - a vote for divided government is a much more effective means to that end, than wasting a vote on an impotent 3rd party. At least 80% of the electorate vote predictably as hard-core partisans, split roughly down the middle, regardless of what they call themselves. Cato Institute studies shows that there is a 12% swing vote that consider themselves civil and social liberals but fiscal conservatives. If half of that block votes consistently for divided government, it is enough to swing our otherwise evenly balanced polarized electorate to keep the government divided. It is the smartest vote that libertarians and true independents can cast. Welcome to Divided Government, Rebecca.
" Even the earthquake/tsunami/nuclear reactor disaster in Japan set off a wave of right wing radio critique of Obama’s emergency preparedness. So divided government is polarization. And yet, it looks more likely every day that Americans and independent voters especially, will choose to re-elect the president and give us a Republican House and Senate. You have to assume that the problems we face as a country can yield to bipartisan solutions, or that elections actually render mandates on the specifics of spending, taxes, and entitlements. " Yes, obviously divided government is polarization. Because we all remember those halcyon days of unpolarized non-partisan unity of purpose that we all enjoyed during the last two years of One Party Democratic Rule under Barack Obama with a $1 trillion dollar (fully loaded) partisan stimulus bill steamrolled over the opposition and the $1 trillion dollar partisan Obamacare bill steamrolled over the opposition or the six years of One Party Republican Rule under George W. Bush and a war in Iraq steamrolled over everyone. Partisan polarization does not start with divided government. Divided government simply assures that everyone in our deeply divided country has a seat at the table when sweeping policies are proposed. If a policy cannot find bipartisan support, then that policy should not be enacted into law. Divided government can help prevent bad policy from becoming law. Welcome to Divided Government. "The showdown that almost lead to a shutdown is the aesthetics of divided government. We might as well get used to it. What we have, after all, are two political parties that hold different views and represent different interests, negotiating hard and down to the wire to get the best agreement they could. It isn’t pretty or perfect by any means, but it is the natural result of the system of government our founders put in place." The post stimulated an interesting comment thread. Check it out and Welcome to Divided Government. "There's been a union backlash movement afoot in the US. The question shouldn't be "why now? ", but rather, "why did it take so long?"." With that, we'll conclude this edition, a day or so late. Sorry about that, but getting the tax return in the mail took priority over the Carnival. The Dividist does not f*ck with the Feds. Look for the next edition of The Carnival of Divided Government Novem et Quadrâgintâ (XLIX) - Special Horse Race Edition - on or about May 7th. That would be Kentucky Derby Day and two days after the first 2012 Republican Presidential nomination horse race event. Please submit your blog article at carnival of divided government using our carnival submission form.